February 10, 2014 February 12, 2014 bcalvanocoachingLeave a Comment on Weekly Angel Oracle Card Reading for February 10 through 16. Weekly Angel Oracle Card Reading for February 10 through 16. This week I am guided to use the Archangel Oracle Cards Deck by Doreen Virtue. This week with Valentine’s Day, often brings a lot of mixed emotions for people . Feeling anxious and stressed out was probably not cupid’s original romantic intention! The angels have special guidance to assist us this holiday and week. 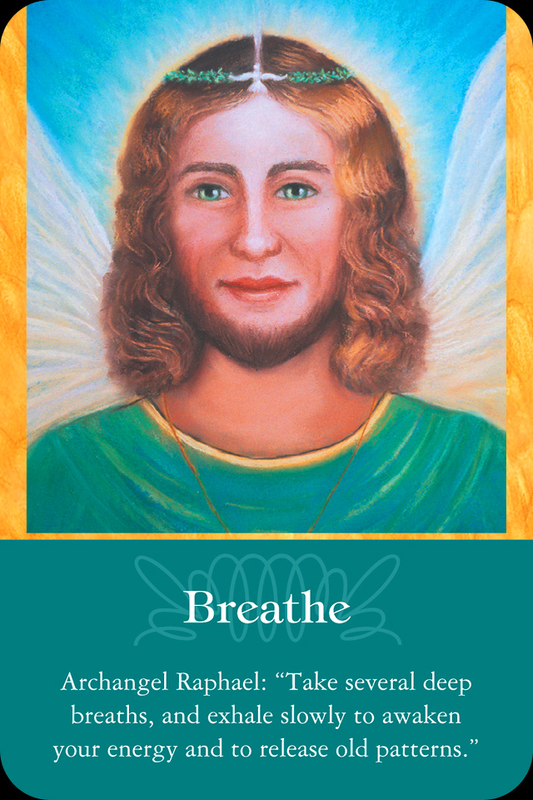 For Monday and Tuesday we have the card, Breathe with Archangel Raphael. Take several deep breaths, and exhale slowly to awaken your energy and to release old patterns. This message includes noticing how stress is affecting us . It’s important to remember to breathe deeply. Oxygenating our mind boy spirit allows us to stay in the moment and flow. By being in fresh air, taking a class such as yoga or any exercise, this supports us in being present. It also assists us in releasing emotions and thoughts that no longer serve us. Archangel Raphael’s name means “Whom God Heals” and he is known as the healing angel. Pay close attention to any message you may receive in your thoughts, dreams and intuition regarding your health. Raphael is guiding us to optimal well being and happiness! 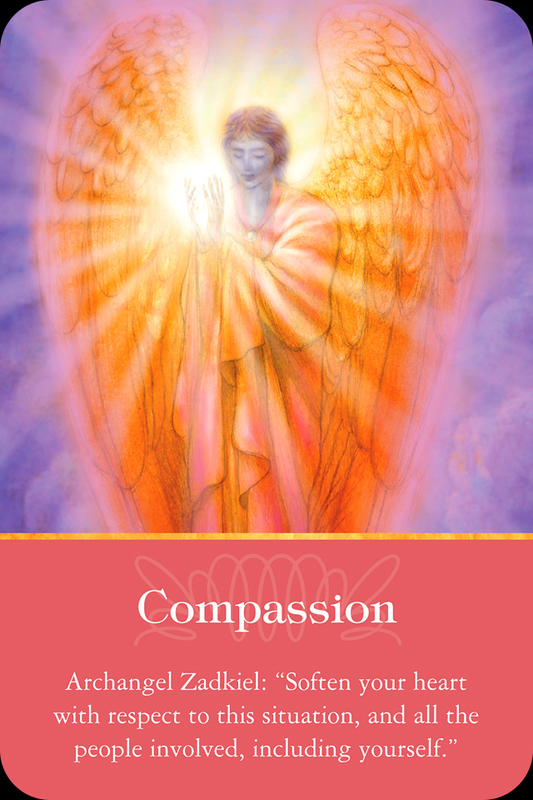 For Wednesday and Thursday we have the card, Compassion with Archangel Zadkiel: Soften your heart with respect to this situation, and all the people involved, including yourself. The message here is to allow compassion to enter those relationships and areas of our lives where it may be missing. True compassion does not discriminate! If you have been being critical and judgmental with yourself especially in regards to relationships, this week we are guided to lighten up and allow some love in. Zadkiel ‘s name means “Righteousness of God’. He assists us on releasing unforgiveness! 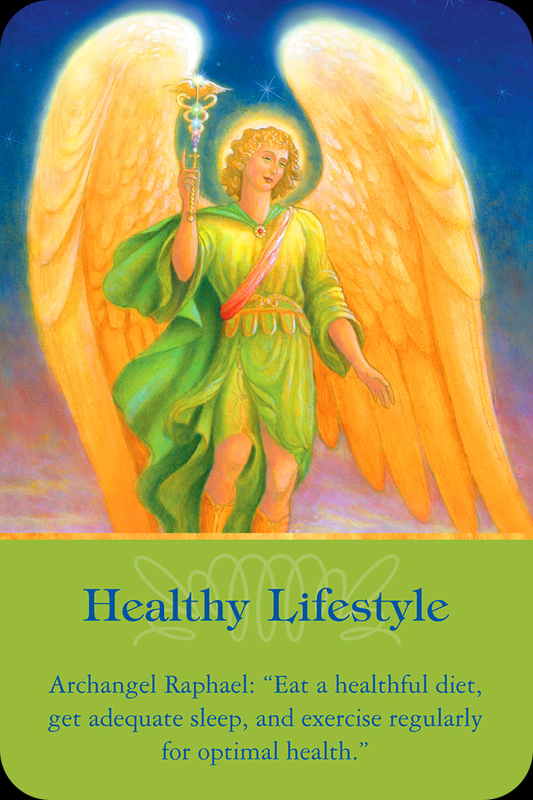 For Friday, Saturday and Sunday we have the card, Healthy Lifestyle: Archangel Raphael: Eat a healthful diet, get adequate sleep, and exercise regularly for optimal health. Often when we get urges to change our diet and lifestyle it is because Raphael is guiding us. It is his response to our requests and prayers for more energy, increased well being and to be happier. When we take excellent care of our bodies our whole outlook on life brightens. Raphael is known as Heaven’s physician. With his emerald green healing light he can support us where healing is needed and even in letting go of addictions and habits that no longer serve us. This week’s message is about being present to our peace or lack of. Loving ourself first so that we can love others. It’s about taking the time to notice we are stressed remembering to relax and breathe. Compassion is emphasized for ourselves and others. Feeling good inside always reflects feeling good outwardly. These are simple messages that can yield powerful changes in our lives. Join me for angel card readings, a guided meditation and powerful energy balancing with Archangel Michael. I will give Goddess guidance oracle card readings. We will call upon the energies of Isis, Mary, Brigit and Kuan Yin to see what guidance they have for us. We will learn how to work with these goddess energies in our daily lives. $44. Includes a Goddess Guidance Oracle Cards Deck by Doreen Virtue. 10 am to 5pm doing 15 & 30 minute readings. Join me where there will be a variety of vendors, speakers and intuitve readers all supporting our mind, body and spirit. I am available for personal readings, talks, angel parties, workshops and mini angel reading events! Join me at my new Youtube Channel where I will be posting videos. Next Weekly Angel Oracle Card Reading for February 17 through 23.